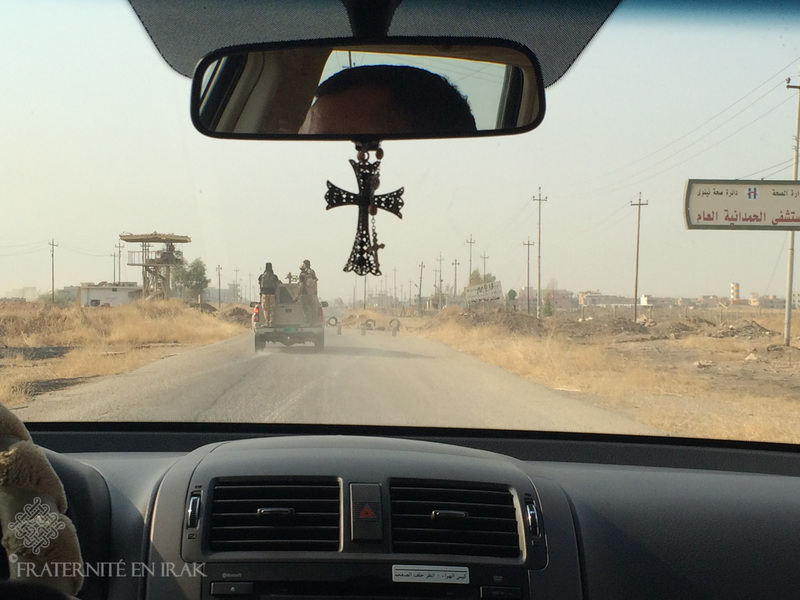 STORY – Fraternity in Iraq joined one of the first delegations who entered Qaraqosh, almost freed, at the end of October. Here is a first overview of the damages, but also hopes, we witnessed. Inventory. 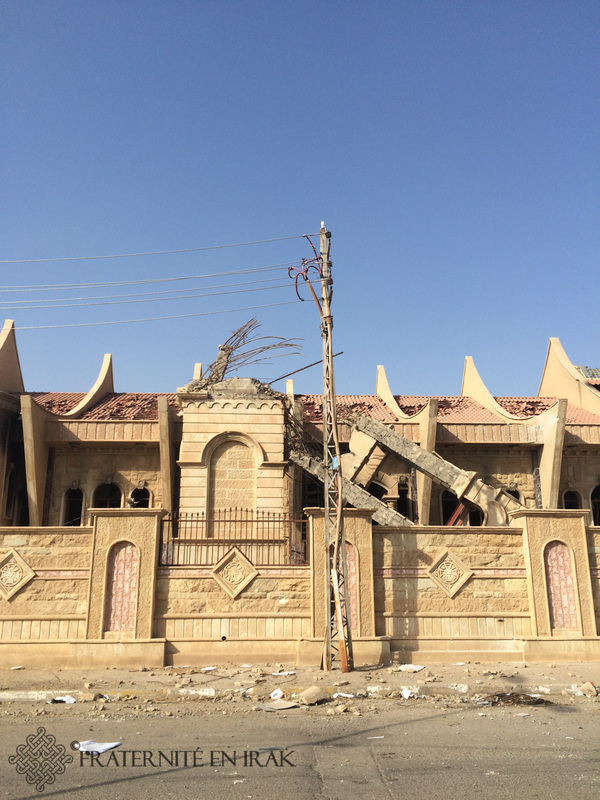 Few buildings were destroyed, but symbolic buildings were targeted first: the “Qaraqosh 1” school collapsed, as did the police station next door and the Al-Hamdaniya university, close to the city. 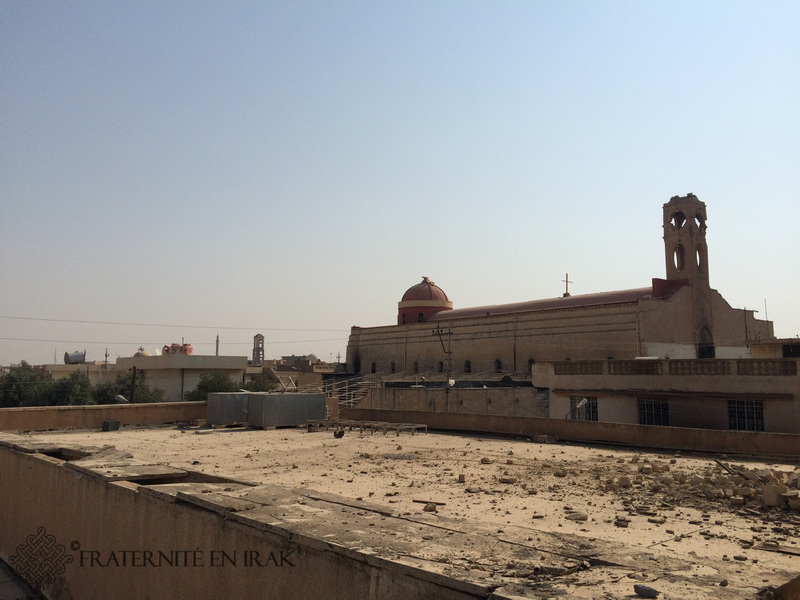 Al-Tahira cathedral, which was used as shooting range by the ISIS fighters, was set on fire. Some of the stones in the choir shattered under the heat. The bell tower was attacked: the bells as well as the last story are now missing. The cathedral’s courtyard was devastated by AK 47 shots; cartridge cases cover the ground. As an additional sign that the cathedral had become a shooting range, we found poster signs explaining how to use a Kalashnikov. In the courtyard, piles of ashes and burnt pages are evidence of ISIS’ effort to destroy local administrative books and registers. Furnitures were thrown out of the windows. Mar-Benham-and-Sarah church sustained a more violent attack. Located across “Love Street”, devastated too, the church no longer has a bell tower: it was dynamited. The church was set on fire. It was Qaraqosh’s most recent church, and the one where the young used to gather thanks to its choir and very active parish life. The altar is the only remaining piece besides the walls and roof, although in very bad condition: here too, the marble shattered under the heat. We then reach the seminary, where Mgr Petros Mouche, bishop of Mossul and Qaraqosh, lived. The inside courtyard looks mined. The bishop’s bedroom and office were sacked, like everywhere else, but it looks like ISIS didn’t stay here: in each room, a thick layer of dust covers the ground. 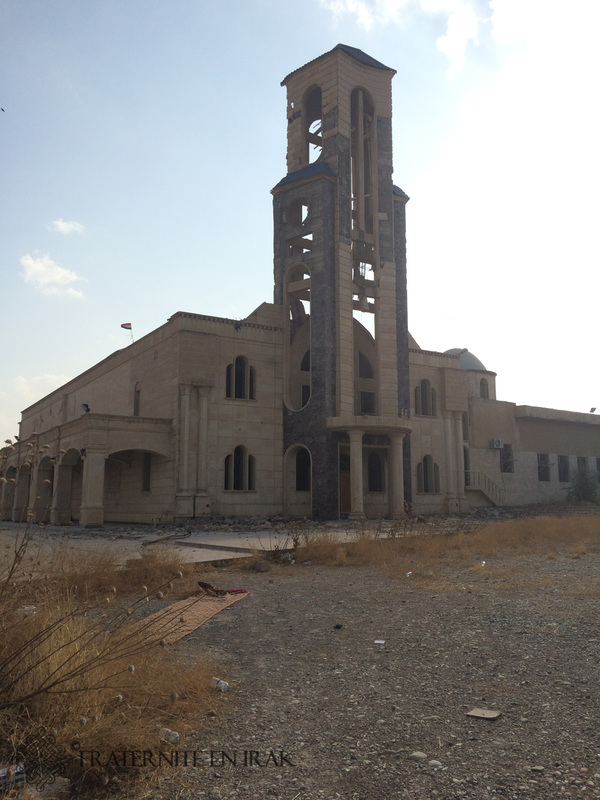 The bells of Mar Youhana church (St John the Baptist) won’t ring before long: they have disappeared from the damaged yet still standing bell tower. The church was home to the second biggest parish in Qaraqosh – more than 1.200 families attended mass here each Sunday. 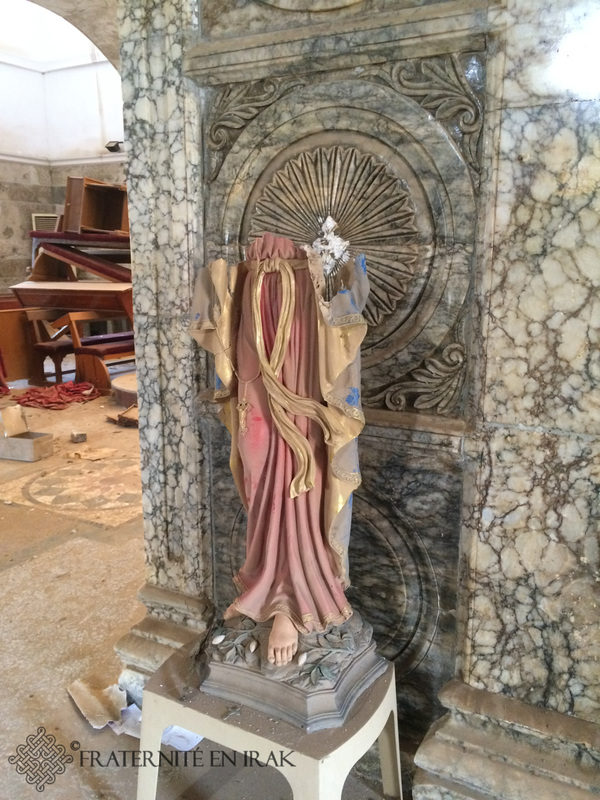 Inside, we find a strange display: contrary to what we have witnessed in the other devastated churches, the jihadists have piled up the benches in the church choir and under the stand, but they haven’t set them on fire, probably caught by time. 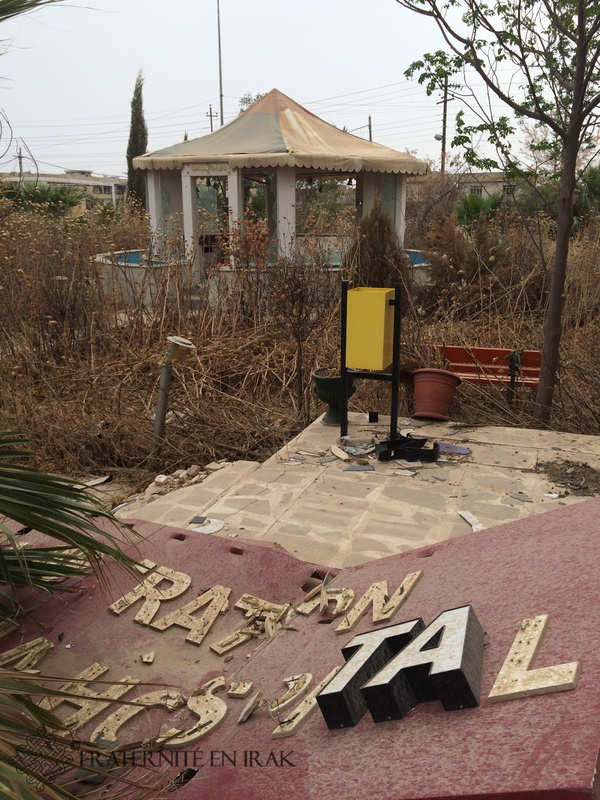 Outside, in the church courtyard, we find the same shot impacts: here too, ISIS trained its soldiers to shoot. We then arrive at Mar Yacoub church. Like in Mar Youhana, it looks like the jihadists made preparations to set the church on fire, but didn’t have time to complete their task, which limited the damages inside. However, all the Christ and saints’ statues were beheaded, and the crosses cut. 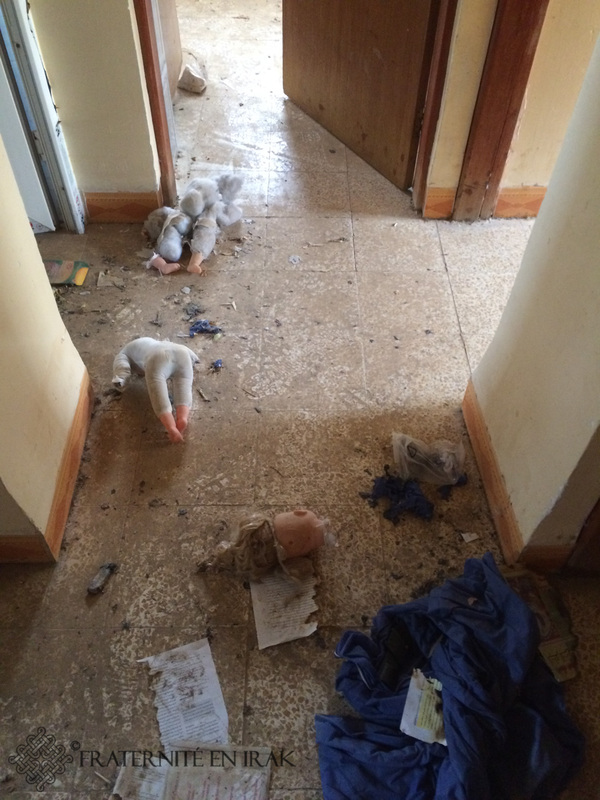 Al-Hamdaniya hospital, the big hospital in the eastern part of the Niniveh plain, sustained the same kind of damages: sacked then destroyed, it was also used as a shooting range. Like in the cathedral, dummies were beheaded after they were used as shooting targets. The terrorists went as far as beheading dolls, that Fraternity in Iraq found. 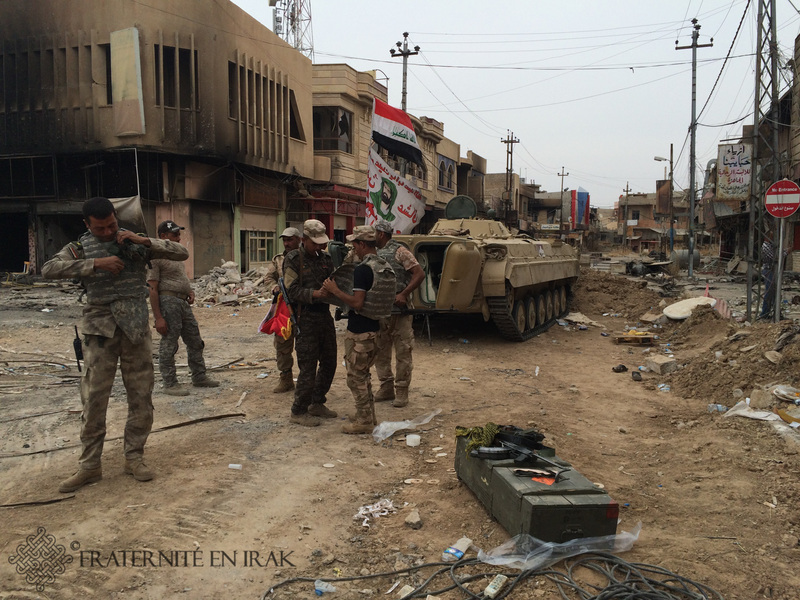 It looks like ISIS never used the hospital to treat soldiers or civilians. Pictures they didn’t like were damaged: icons, paintings of the Christ, framed diplomas… even breastfeeding posters! This big hospital was the pride of Qaraqosh doctors, as it gathered all the services and units needed by the population living in the eastern part of the Niniveh plain. It was the most important hospital after Mossul’s, with the best ratings for quality of care in all the Niniveh plain. Today, all is left is a number of empty buildings, although 95% of the walls and roofs, except for the burnt parts, are intact. You can read : Emergency for mine clearance of the Niniveh plain ! 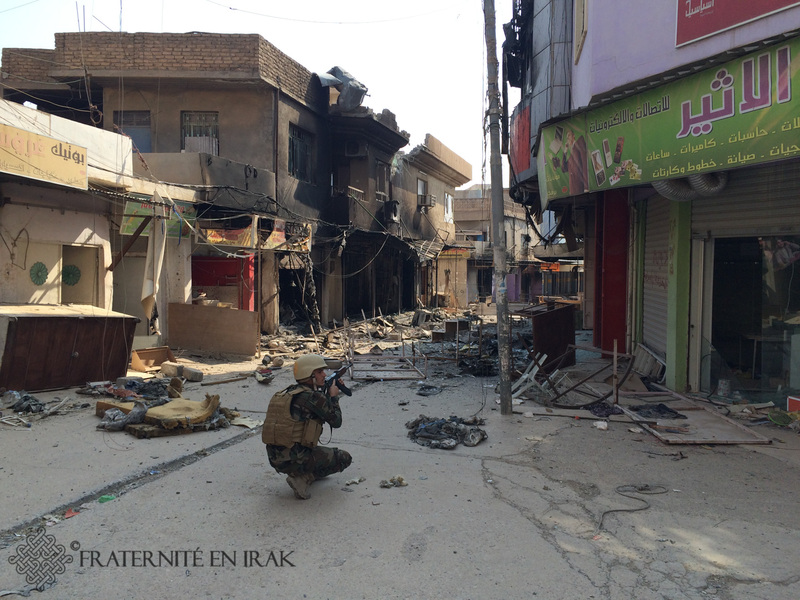 The city was sacked as soon as it was occupied in August 2014, before it became the residence of some of ISIS’ general staff. With the imminent attack on Mossul these past few weeks, the jihadists set many buildings on fire in Qaraqosh, as many as possible, to cover their retreat. Today, most of the shops, and every other house, was burnt: the streets smell of burnt plastic and some ashes are still warm. Explosive devices stored in many neighborhoods, as well as soldiers’ testimonials, all indicate that the buildings and streets are mined. 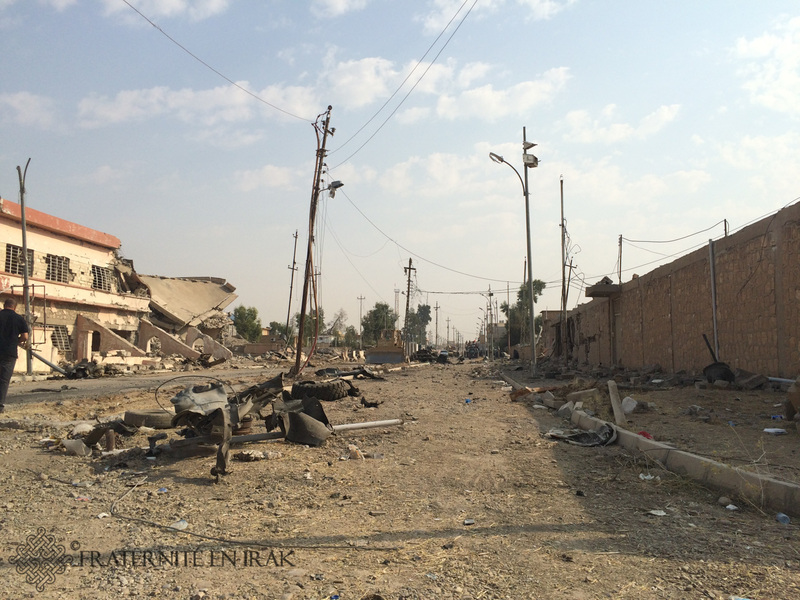 There are however few total destructions: Qaraqosh, the most important Christian city in Iraq, didn’t sustain the same level of damages as Sinjar, the Yazidi city, which lost 75% of its surface. Here, most of the walls are standing. Burnt and shot, but standing. 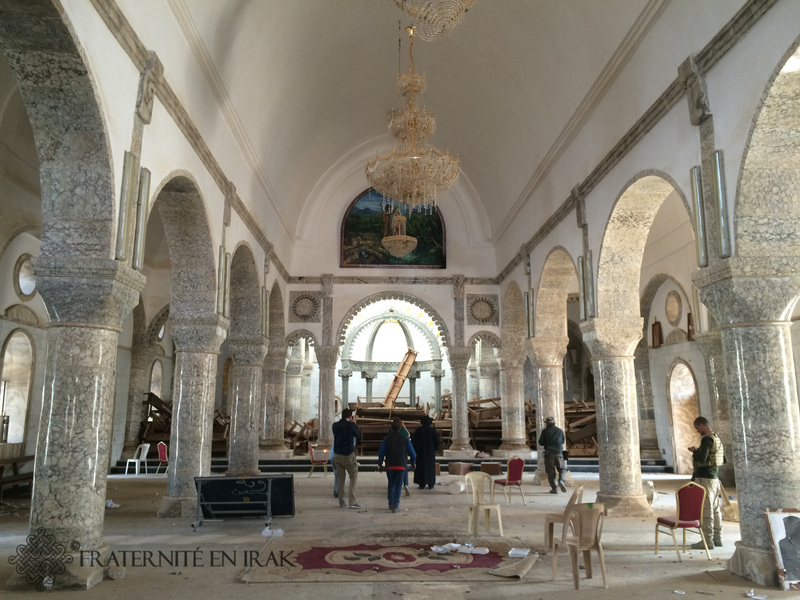 Qaraqosh went through flames, death and occupation, but its houses and churches rising toward the sky mirror the strength of its Christian people, these refugees who impress us with their capacity to get back on their feet, again and again – and it’s been more than two years now. 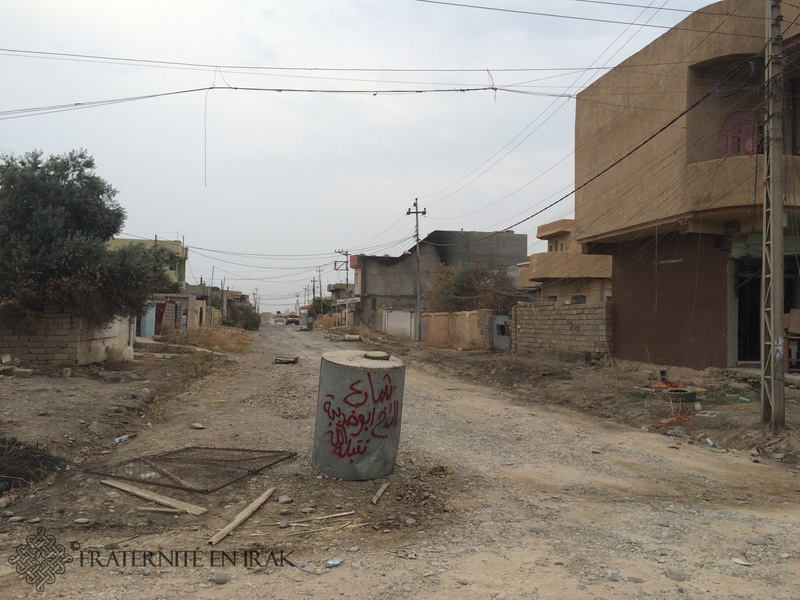 For the members of Fraternity in Iraq, being able to re-enter Qaraqosh is a strong emotion, as it’s where our association started in 2011. 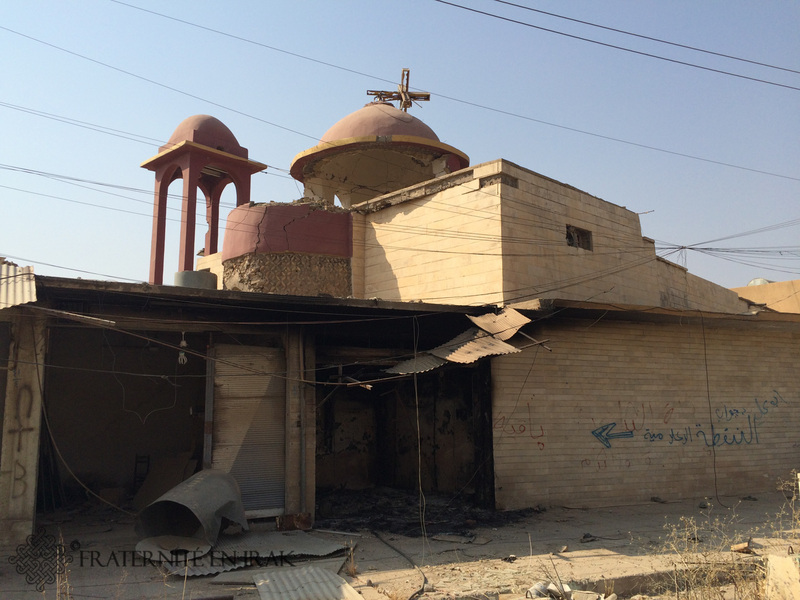 With your help, the Brotherhood with Iraq wants to continue to help the Christians and minorities in the Niniveh plain. Please give and share Qaraqosh updates around you, so that the city can be cleared of landmines as soon as possible, re-built and repopulated by its inhabitants!